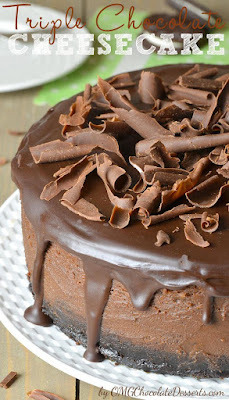 Triple Chocolate Cheesecake with Oreo Crust is reach and decadent, triple chocolate treat. Preheat oven to 350 degrees F, grease a 9-inch springform pan and set aside. Press crumb mixture onto the bottom of the prepared pan and bake for 6 minutes. Remove from the oven and set on a wire rack to cool while making the filling. Melt 10 ounces bittersweet chocolate and set aside to cool. Add the eggs one at a time, mixing on low speed and do not overbeat it. Add melted chocolate and mix on low speed to combine. Pour the filling over the crust and smooth the top. Bake the cheesecake until the center is set and the top looks dry (about 1 hour to 1 hour 10 minutes). Cool on a wire rack for 5 minutes, then run a thin knife around the sides of the pan and set the cake in the refrigerator (uncovered), for at least 8 hours, or better overnight. This cheesecake can be prepared up to 2-3 days in advance just store covered in the refrigerator. Garnish with chocolate curls (optional). 0 Response to "Triple Chocolate Cheesecake with Oreo Crust"